204 Pages. A single copy of the Volume 50, Number 3, Collector’s Edition celebrating 50 Volumes of the PWC Newsletter. 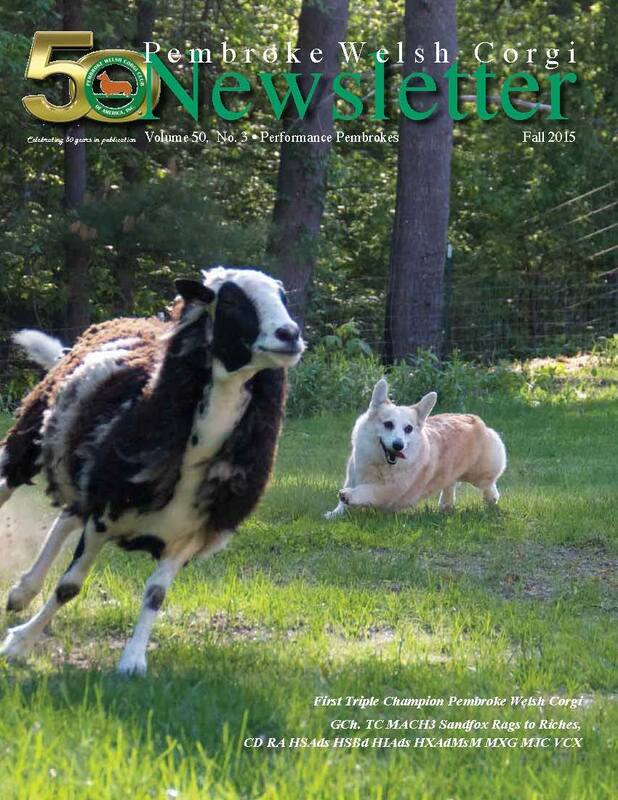 The Performance Issue, Fall 2015, of the PWC Newsletter with a cover featuring the first Pembroke Welsh Corgi Triple Champion. Eighty-eight pages of color features and ads, including Part Two of the two-part history of the PWC Newsletter and an article chronicling the history of companion and performance events in the PWC Newsletter. Interviews with Carol Donnelly, owner and trainer of the first Pembroke triple champion, with Leanne Capozzi, trainer of the first Pembroke obedience grand master, and with Judy Garbarino, breeder of generations of herding titled and herding champion Pembrokes. Also in this issue, the 2014 Annual Awards in Companion Events, Herding and Versatility. Additionally, articles on shaping puppies for performance success, tracking, online training classes, upcoming changes to AKC agility and obedience, and on disaster relief trailers. Columns by the PWCCA President, PWC Newsletter Editor, the Performance Editor and the Advertising Editor, plus a report by the AKC Delegate Anne Bowes. Specialty reports from Ohio Valley, North Texas, PWCC of Greater Atlanta, PWCC of the Potomac, Golden Gate, Gaitway and Mayflower. The Regional Talebearers Spotlight features Cascade Pembroke Welsh Corgi Club with pictures. Rounding out this issue is the Calendar of Events, PWCCA Business information, and color and b/w ads featuring PWCs. Available only as long as supplies last.